I’ve run a few marathons. In New York they publish the finishing times in the paper the next day. For some reason I would look at the later finishers to see the oldest ones. I don’t know why. I guess I found it inspirational. In the ones I’ve run a 91 year old man and an 88 year old woman finished. I used to tease my mom: “You could train for twenty years and still be younger than a woman who finished one I was in.” At the finish of my last one, the only one she had been able to attend, overcome with emotion, she said she would train for one. The farthest she had run by then was five kilometers, ten years ago, in a fun run she came last in. I’ve held her to it, even as the rest of my family warned she would just injure herself. Actually, I can’t say I held her to it since she’s gotten totally into it on her own. 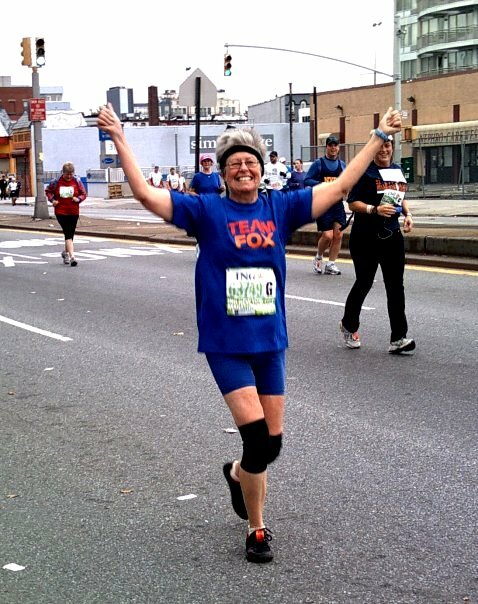 She’s scheduled to run the New York Marathon November 1st. She’s up to about fifteen miles in her training runs and increasing. Since many people think marathons are about who you are rather than how much you’ve trained, making them think it’s impossible, their training redefines possibility for them. They realize their identity is much more under their control than they thought and changing it is easier than they thought. Some people believe running a marathon is a physical impossibility, which makes their redefinition all the more profound. Anyway, she turned 66 last month. Yesterday was the Marathon. My stepfather and I took the subway along the route to cheer her on in multiple places: Brooklyn, First Avenue in Manhattan, Central Park East Side, then at the finish. Anyway, she finished in 6:55, in 42,900th place out of 43,741 starters. At dinner she was very tired but in great spirits. I haven’t found out how sore she is yet today. THANKS for encouraging me to run this marathon. Your support was key to my finishing and I really appreciate that. I am not sure that finishing a marathon had been on my bucket list, but now that I have done it, I am glad that I did. I hurt really a lot during the night, hard to sleep, but oddly, this morning I feel pretty good, not much more stiff than ordinary runs. You are right that after 26.2 miles, 5 miles seems ordinary. 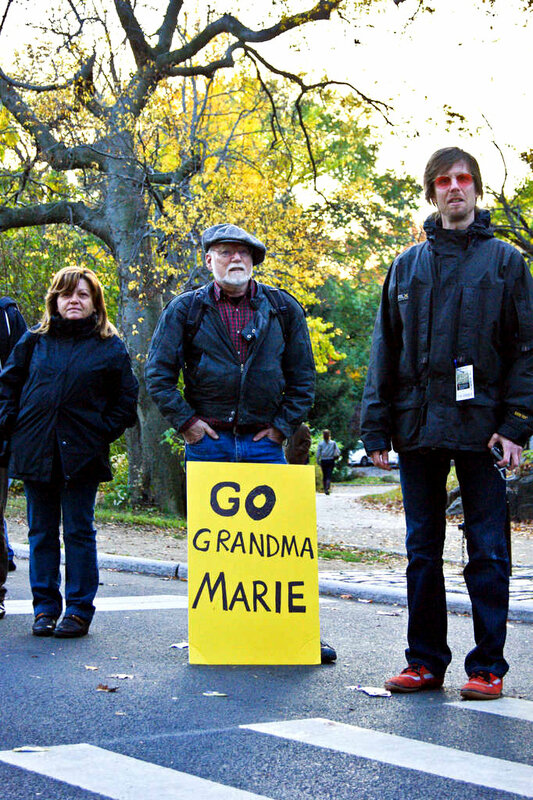 Turns out that my physical therapist was there in the Park and saw you and Bill…and the SIGN…said that she was sure Grandma Marie was her patient. She helped another patient, who was about a mile ahead of me walk to the finish line. I emailed back that if the other patient was already a mile ahead of me, I clearly needed more help. But, in the end, I did it my way: finding what I needed to find to get across the finish line. THANKS for asking if you and Bill should come with me for that last mile. I needed to be alone; to find my own reserves. My marathon was HARD, and I can see if I had had a couple more LONG runs in, I would have had better times. However, I DID finish, was not the last one, not sure about my age group. Brooklyn was great…Bill & Josh held up a BIG sign “Go Grandma Marie” and then about 1 mile later, Penny from Amherst, MA saw me and cheered. My “wall” was about mile 15, going across the Queensborough Bridge…very lonely and I lost those with whom I had been running. When Bill & Josh then saw me at 73rd and 1st Ave. they were worried. However, I saw the sign, Go Grandma Marie, and a bunch of young people on the roof of a tall building across the street had, apparently, been watching the sign, so when they saw Bill & Josh get excited, they all started yelling from the roof top, and so I got some energy. I made it into the Bronx before they closed the Willis Bridge, so I can honestly say, I ran the WHOLE THING…well, the last 8 miles were gruesome…walking, hip hurting, and then a women that I had met at the very beginning came by, and told me about the Willis Bridge, and the suggested that I really wiggle my hips, exaggerate, and so I tried that and walked…whenever I paused, muscles would seize up, so couldn’t stop. Bill & Josh saw me again just in Central Park, and later, I told Bill that I wasn’t sure at that point if I could make it, and he said, he knew that even if I had to crawl, he knew that I would finish…so that was a nice vote of confidence. I thought that the finish line would NEVER appear…at one point I snarled at a by-stander, “Where is the damn finish line?” She laughed and said, soon… It was so dark, and once I finished, I could barely stand, and two different medics wondered if I were okay. One dialed Bill’s number on her cellphone and told him where he and Josh could retrieve me. In retrospect, I wish that I had had 4 16-mile runs and 2 18-mile runs, however, I didn’t, but I did meet my goals. Josh & Bill & I had dinner at Pomodoros’ …Italian seemed really like the right food. (one year later) This year neither my mom nor I got numbers in the lottery so we went to watch with my nephew. I’m sure you all know or can imagine the difference between watching a marathon and watching a marathon after your first running. Anyway, the best part was that when we went to the same place on First Avenue where I cheered her last year, I had the crazy idea to see if that party was happening again this year and try to go. Who knew what might come of it? We went to the building and buzzed on buzzers until someone let us in. We walked to the top floor and found a ladder to the roof. I went up first, my mom to follow, then my nephew. When I got to the top, I saw the people at the party, so it was on. The closest person looked at me like who was I but said hello in a friendly enough way. I asked if he had been there the year before. He said no, but pointed me to another guy. I asked that guy if he had been there the year before. He said, yes it’s his party, wondering who I was. Without pausing I asked if he remembered cheering for someone named Grandma Marie. He said, wondering more what I was getting at, “Yes…” So I announced, “Well here she is!” proudly pointing at the gray haired woman just climbing up the ladder. He lit up like a Christmas Tree: “No WAY! Grandma Marie!?! ?” and came over to help her up the ladder, introduce himself, and tell her what a star she was last year and how everyone loved cheering her more than anyone else. They had seen the sign and my stepfather and me waiting and waiting for her. Maybe a half-dozen of the people at the party had been there the year before and they gave her the celebrity treatment. Even though she had been in a hurry by that point to meet my sister in Queens (crossing First Avenue to get to the party took hours so she was late), she basked in her celebrity glory, telling stories, and all-around inspiring people for a good half hour before leaving. Here’s me telling some of the story in front of an audience. Near New York City? Watch the marathon November 3!